55 Cool Ways to Rock Burgundy Hair Color - Time for Wine! 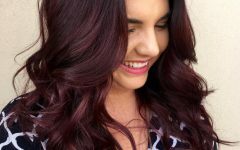 55 Wonderful Ways to Rock Burgundy Hair Color — Time for Wine! If you love having a red tone on your hair, the Burgundy hair color will help you attain your desired look. It offers different tones that can match any skin complexion making you easily noticeable. Here are outstanding 55 burgundy tones that will give you a super glamorous look. This deep red wine hue is mostly suitable for the people that have the rough hair type. It blends perfectly with your natural hair to produce a vibrant shiny appearance all day long. With constant treatment with the color hair gloss, the shade will keep gleaming at all times. You don’t have to worry about your skin tone because it is fit for every skin complexion. You don’t have to do away with your natural tone to become elegant. Adding a claret hue to your black hair strands ends will transform your look magically. Your natural tone will be retained at the front and then the edges of your hair will be colored with a faded hint of burgundy. This hairdo is appropriate for most occasions and seasons. Being graceful can be achieved without too much effort. You don’t have to have multiple or shouting colors on your head to get an admirable look. You can make the best out of your long curly strands by sparingly adding a hint of a deep purple hue as you preserve you black hair. Braiding some portion of your hair will make the tint more visible and attractive. If you love being noticed, this deep garnet hair color will suit your needs effectively. It has a quite striking appearance that will continually keep everyone’s eyes on you. If you have a pinky glowing skin complexion, this hairdo will work flawlessly for you. Your natural dark hair can make this possible in just an instant! When you decide on having burgundy shade on your hair, you have the option of either using the darker or the lighter tone. If you would want to maintain your natural look it is definite that you will go for the lighter shades. Having a faded reddish-purple tint placed on your dark curly strands will enhance its glow and brightness. With this tint, you can confidently attend all kinds of events without receiving strange looks from your friends. Are you the reserved type that is afraid to attract any slight attention? The faded Burgundy ombre will help you enjoy fashion as you retain your personality. The red-wine hint will be placed at the edges of your black strands while the baseline and the front hair are left with its natural tone. Do you love having a unique tough look? Adding some Daret tint to your stylish bob haircut will give you a tough celebrity look. Your hair will be split into three portions: some hair strands will fall on your forehead, some on the cheeks and the rest on the shoulders. With this hairdo, you can decide to be the carefree girl and let the wind blow your hair to any direction. Sometimes it is interesting to have a blend of colors on your hair. The deep purple and red combination produce a glossy fashionable look. You will have purple and red hue ribbons neatly intertwined on top of your lovely straight dark hair. There is no age limit to this hairdo; everyone deserves to be beautiful regardless of their age. Your natural black curly hair deserves a better look. You will not need much effort to give it a transforming style. You can color your strands with claret burgundy hue to give them a shiny appealing look. The hue from the roots will effortlessly wash down to light colored ends. If you are the kind of girl that loves attention having a multi-colored hair will help you obtain the attention you want. A red wine/grey/ blue hue combination will give you the most glamorous catchy look. You can have the red wine hue placed at the front and the blue hue at the back while placing some greyish hue strands in the middle. It is vital for every girl to heighten their feminine nature. You can make your blonde hair brighter by partially coloring it with the burgundy hue. Placing the ruby hue at the front while you retain your natural blonde hair at the back will enhance your elegance as you maintain a simple look. Having a hot flashy look will boost your confidence in a big way. The purple and red burgundy blend will give your hair a glossy classic look all day long. You will have the red hue on the baseline and some lavender purple hue locks placed at the top to give you a smashing look. If you want to achieve the finest look from your bob haircut, you can color your hair with a deep red wine hue to make it glitzy. Splitting your hair to fall on your two cheeks will make your face frame and the hairdo more splendid. This dark shade will leave you with the most natural look and it is fit for any hair coarseness. It takes a daring personality to beat the usual. You can have the red/ yellow/orange hue blend colored on your hair to make you outstanding among your friends. These hues combination will add charm and thrill to your curly strands to make you a striking beauty. Some girls can never let go of their natural hair tone. If you are this kind you can add some little flavor to your hair by coloring it with the faded claret hue. The tint will make your hair ends shiny and stylish in appearance. This burgundy hair color is perfect for giving your hair a shiny attractive look. The red hue is evenly spread on every strand of your hair to achieve a flashy look. This tint is appropriate for any skin complexion and the naturally dark or light hair. It is wholesome for all the events in your diary and you do not have to work so hard to achieve it. If losing your original hair complexion is a big deal, you can color it with a burgundy shade while still maintaining your natural hair tone. You can have the faded red wine hue colored on your back strands while the front hair is left unaltered. This looks work well with the girls that love a simple stylish look for an enjoyable day with their peers. Did you know that you can have your hair twisted into adorable burgundy braids? You can have the red hue colored on some portions of your hair to have a red and black combination. The evenly arranged tinted braids will give you the most elegant look you’ve ever imagined. You can be sure that with such impressive braids on your head you will be the attraction of everyone at work. Your beautiful black straight hair strands can be made healthier and glossy if you add some touch of a reddish tint to them. This shade will enhance the appearance of your hair and it is also fit for all kinds of events. It works well for all skin complexions and all hair textures whether light or bristly. This ruby hue is quite magnificent and it will have all eyes on you all day long. It will help you show off your curly long hair strands and also add on to your confidence. With the hair strands fallen on your chest, you will achieve the most admirable look for all occasions. 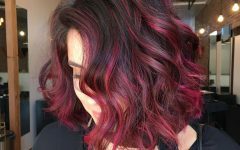 If you don’t love shouting colors all over your hair you will absolutely love the new look you will obtain if you give a try on the scattered red wine hue. You will have the red hue slightly colored at the front of your head while it is highly concentrated at the back to give your hair edges a shiny glamorous look. Do you want to make some little change to break the monotony of your black long hair? It is quite simple and effortless. You can have the ends of your strands colored with a red wine tint to make a remarkable difference. The tint will make you hair edges look flashy as you maintain a modest look. The red wine color works well with almost all skin tones but you need to choose the one that is ideal for you. With the above-given variety of burgundy shades you won’t miss your perfect color! Go ahead and rock your world! You can rock your neighborhood just by adding some simple touch to your black elegant hair. Your black hair can make you an ideal beauty if you add a red wine tint to its ends, especially when keeping the hair straight. An inverted bob cut will be perfect for demonstrating the full dimension of the color and shine. Are you very obsessed with your black hair and you can’t trade it for anything? Well, you still deserve to be stylish along your reserved personality. Having a dull red wine hint added on the curly ends of your black hair will enhance your hair look remarkable. Styling your hair to lie on your shoulders will make the hairdo more enticing. Want to have the hottest look among your peers? The bob haircut is one of the hairdos that will give you the hottest look. Coloring your bob cut with a hot red wine tint will enhance your appearance amazingly. This shade is suitable for all events and it can match with most skin tones. Your straight long strands can look more elegant if they are colored with some brighter tint. You can have your hair tinted with faded crimson shade to give you a unique classic look. This hair shade is appropriate for most skin tones and hair coarseness. It will also be ideal for your special days and events. Do you have a short curly hair and you love being fashionable? Having the cherry red hint added on your curly hair will give you an awesome elegant look. The hint is reservedly colored on your hair to leave you with a classic modern look. You can be all comfortable with this shade because it is suitable for all skin types and seasons. Every modern girl likes to have an enticing look on their hair. The red purplish combination will give your natural hair a new magic look. Your hair is colored with a red hue from the baseline and some purple ribbons on top to give it a glamorous look. With such a tint, your confidence will be highly enhanced. A mix of purple and red wine hues braided evenly can give you the most fashionable appearance ever. With the slack purplish braids all over your head, you will achieve a unique and adorable look. This hairdo will give you the most pleasing look for wedding occasions and parties. This Burgundy shade is the absolute color to give you an amazing cherry look you want. Having the red wine shade on your head from the baseline to the edges you will have the glossiest look ever. With your original dark or light hair, you can easily attain this graceful look effortlessly. When you decide on having the burgundy shade on your hair you will need to find out the hue that will fit your skin type perfectly. Your long bob haircut can never go wrong with the burgundy hair color. The ruby red color is placed on the baseline of your hair strands while the red wine hue is highlighted on the top. This ruby hue will boost your look remarkably because it will help your beautiful complexion become more visible. It is for the bold and beautiful, and you have all you wish for in your hair. You can add some special effects to your long shiny bob cut to make it more splendid. This garnet hue ombre is perfect for you if you don’t love shouting colors on your hair. The rich red wine hue is slightly colored at the front while it is concentrated at the edges of your strands to give them a shiny appearance. You don’t have to worry about your skin complexion because this hue fits flawlessly with all skin tones. Your glamorous wavy long curls would just get better if they are given a touch of burgundy shade. This burgundy ombre will have your classic curls tinted with the ruby hue while retaining your normal hair tone at the front. If you want to show off the glamor, you can style the curls to fall freely on your back. The tint is very convenient since it is fit for all occasions. The auburn–aired girls will always look glamorous and stylish. With your long curly hair, you can make the best look by adding some auburn hint. You can add some blonde spots on the hair to give it a trendy look. A pair of glasses will work perfectly to add some more flavor to your hairdo for the summer days. Do you want to have a really stunning look of your hairdo? You can have a faded burgundy shade on your black hair to make it stylish as you maintain its natural tone. You will have dull red wine hue streaks on the front part and intensified red wine hue at the curvy edges of your hair. This burgundy hue is moderate and it is fit for all events. If you are the conservative type of girl and you don’t like hair shades that will draw so much attention, you can go for the violet burgundy hue on the edges of your strands. This shade will give your hair a new gorgeous look and enhance your self-esteem. It is always easy to have a stunning look with this kind of hair. Your long straight hair can become classier without much effort. Having the red–purplish hue colored from the baseline of your strands will help you get the most amazing look. This hint will give your hair a flashy classic look for all kinds of events you would want to attend. It is fit for all skin complexions and hair textures. Do you want to add some glamor to your stylish short hair? You can make it possible by coloring your hair strands with a hot red wine hue. The red wine tint will give you a shiny enticing look that will make you stand out among your friends. Styling the hair in a carefree way will make the tint more visible and attractive. It is always simple to pull out an excellent look in a simple way. You can add more charm your long hair with burgundy shade by braiding some portions of your hair. It will give you the most natural and lovely look you would want. With the hair and the braids held at the center, you will achieve an alluring appearance. This hairdo suits most types of hair and skin tones. Playing with colors on your head does not call for getting rid of your natural hair tone. You can have a varied burgundy hint to add charm to your hair as you retain the original hair color. The red wine tint will be scarcely placed on your strands leaving some brown patches to give them a glowing classic look for all seasons. You can make most out of your burgundy shaded hair and give it a classy look. Your long hair can be braided and tucked at the middle while stressing the red wine hue one a single braid to make it more noticeable. This hairdo will help you break the usual style of having your hair laid on the back as you keep it elegant. 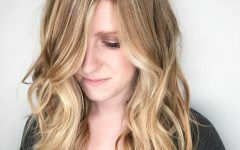 Do you want a real summertime hair color? The blonde and claret hues work perfectly together to bring out a sophisticated look. The red wine hue will be intensified at front part while on the back part you will have the flaxen hue. You can have your long curls relaxed on your back to make the tint noticeable and elegant. Did you know that a double braid plait on your head can make you look different and classy? You can have your black long hair plaited in two braids that will be colored with a red wine hue to make them shiny and stylish. This look is perfect for a modern girl that desires to be peculiar. Making a variation to transform your normal hair tone does not mean that you have to invest too much effort in it. You can have a faded red wine tint placed on your hair from the baseline. This hint will give your hair a magic transformation and help you achieve refinement. It also works appropriately on all skin types. You don’t have to mingle multiple hues on your head to be elegant. You can have a single burgundy shade colored on your hair and still achieve a splendid look. The red wine hue will be evenly colored on your strands from the baseline to tips to give you a graceful look. Do you love it when all eyes are on you and all because of burgundy hair color? You can have pinkish red wine hue colored on your normal hair tone to achieve an elegant admirable look. The tint will be placed from the bottom to ends of your curly hair strands to give you a refined look. You bob cut can never get better than when it is colored with a red -purplish hint. The red wine hint on the bottom is highlighted with purple hue ribbons to give your hair a classy royal look. You want to make your curly hair have the hottest look? This can be achieved by coloring it with the red-purplish burgundy tint. The tint will be spread from the foot of your hair strands all the way to the lengths. To make the hairdo more elegant, you can tie your curly hair at the back to make the curly sweet ends more noticeable. You can enjoy style with your long elegant hair without much play. Giving your long hair an intense splash of the red wine hue will give you the uttermost elegance without much work. This hairdo is good for attending most occasions and it will save you the pressure of going to the salon every now and then. The purplish burgundy hint comes along to give you a splashy imperial look all day long. You will have your natural hair tone colored with the reddish–purple tint to achieve the one of a kind admirable look. This shade is suitable for all hair types. Want a hairdo to keep you glossy on a special day out with friends? Playing with the red and purple hues on your hair will help you rock the day. You will have the purple and red hue ribbons properly intertwined on your hair to attain a striking look. Letting your hair fall on the back in a carefree style will help you obtain more glamour on your appearance. If you are out in search for a flashy hair tone to enhance your appearance the claret hue is best for you. You will have your natural hair tone colored with this deep claret hue to achieve a charming modern look. With the glossy curly ends styled to lay on your back you will have the most incredible look fit for any event. You can simply have a glow for all occasions by coloring your hair with the faded red wine hue. It will easily melt into your curly hair strands to give them the best natural graceful look. The ruby hair hue will work perfectly to enhance the look of your straight graceful long hair. The ruby hue will be colored on the baseline and the length of your hair strands to create a uniform beautiful look. Be the most elegant girl of the day by having this burgundy maroon hue colored on your hair from the bottom to the tips. With some slight red wine touch on top you will achieve a smart classic look. 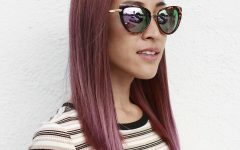 From the given types burgundy hair shades, you can be sure that you won’t miss it when it comes to choosing the right one that suits your hair type, skin tone, and above all your personality.